The educational opportunity in Virtual Worlds such as Second Life may not be a replacement for the doctor- or nurse-patient interaction or relationship, but they may serve as an adjunct or pre- or post-learning tool. In virtual worlds you can design and construct unique environments and then share them with others in a collaborative fashion. Learners actively build and interact in environments that promote creativity and social networking. 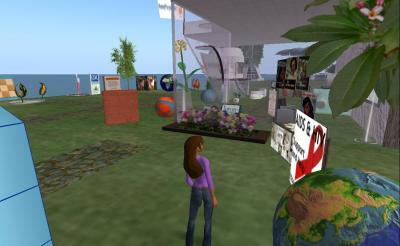 Educators have to write specific learning goals for these virtual world simulations. Virtual world is available 24/7 there is an anytime/anywhere benefit for distance education students. Healthcare consumers have the advantage of being able to log in on and learning from events happening in Second Life and other virtual worlds (e.g. the 2006 health fair). This is especially useful if the individual is at a physical distance. Virtual worlds can be used for role-playing, simulation, and personal interaction associated with the technology. Learners actively interact with content and role play skills associated with their profession. By allowing students time to interact with other avatars (eg, patients, staff members, and other healthcare professionals) in a safe, simulated environment, a decrease in student anxiety, an increase in competency in learning a new skill, and encouragement to cooperate and collaborate, as well as resolve conflicts, is possible. Another example is a 3-D virtual world online simulation incorporating a Massively Multiplayer Online Game (MMOG) platform, which trains healthcare professionals for a mass casualty event. Furthermore, virtual medical universities exist all over the world. In virtual worlds avatars are used. An avatar is a computer user’s representation of himself/herself or alter ego, whether in the form of a three-dimensional model used in online communities such as second life. The use of virtual simulations to teach healthcare students has not been researched so it’s outcome is questionable until more research is conducted and educational outcomes are realized. A negative human response to other avatars in the learning environment is possible; however, this may exist in traditional learning settings as well. The allure of the dynamic colourful Virtual World environment may distract the student’s attention from the learning objectives. Educational research regarding 3-D virtual worlds and the effects on learning outcomes is lacking. To my opinion these trends can’t be stopped, we have to watch out for uncritical optimism and develop these kind of educational tools when clearly relevant and with added value to older educational tools. The Human Community seeks to educate students in ways that have been fundamental to higher education and to thinking people for centuries.